Looking back on the development of my taste in music over the last nine years, there’ve been some musicians who have quite clearly influenced me. Those who made me dive deeper into a specific genre or like-minded acts, simply because of the albums they recorded or the shows I saw them play. Causing me to want more of whatever that was. Sometimes that was specific; an instrument, a label or a city. Other times it seemed more vague and what had me hooked was the feeling a record gave me or the attitude a band showed on stage. One of those pillars for me has been the incredibly prolific Scottish folk musician Alasdair Roberts. The tall singer from Glasgow has been releasing one album after another, be it as a solo artist on Drag City, with Appendix Out, in collaboration with other artists or – more recently – as part of the Furrow Collective. On February 24th his latest LP Pangs was released and it has got to be one of his most urgent and direct records. Probably the easiest to start with for listeners who aren’t necessarily folk music lovers, without compromising on quality for even a second. As I’ve written before, the first time I met Roberts was back in March 2009, during my first visit to a city that’s now become a second hometown to me: Glasgow. We filmed a session with him and his bass player Stevie Jones (check out his band Sound Of Yell) in a freezing cold factory building where Davie Lawson worked at the time. I’ve had the pleasure of meeting up with Roberts a bunch of times since, both in Glasgow and in Utrecht and have been stunned by his knowledge and talent every time. Last November, I had a short visit in Glasgow to film with Doghouse Roses and asked Roberts if we could meet up the following morning and film a couple of songs. So we did. At Jones’ studio in Kinning Park Complex, Roberts and Jones played No Dawn Song from the new record and the traditional song The Golden Vanity. 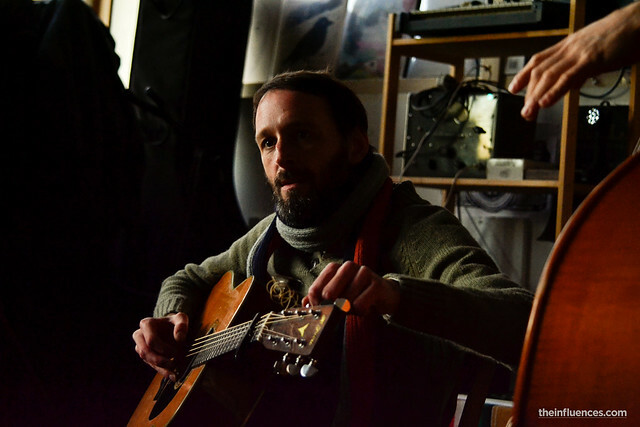 Alasdair Roberts is touring in the UK as a trio with Stevie Jones and Alex Neilson. Watch all tour dates. This is a traditional song, meaning there is no ‘original’ available online.